What is better than drawing? Bringing in your favorite stuffed animals from home to draw, of course! will spark interest and excitement. to foster interactions and positive connections in the class. Don't forget to have extras on hand in case some kids forget! Send an email to parents or a note home to help the kids remember. I saw this on Donna Downey's blog who saw it on where else, but Pinterest, of course! Doesn't it sum up why most of us blog? 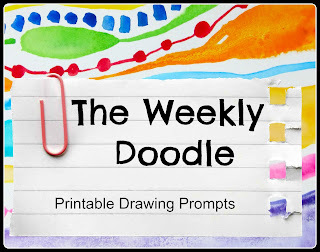 One of the reasons I started blogging was because I discovered that there were so many good art teacher blogs out there and I was getting so many good ideas from them, that I thought I should share some of my own. 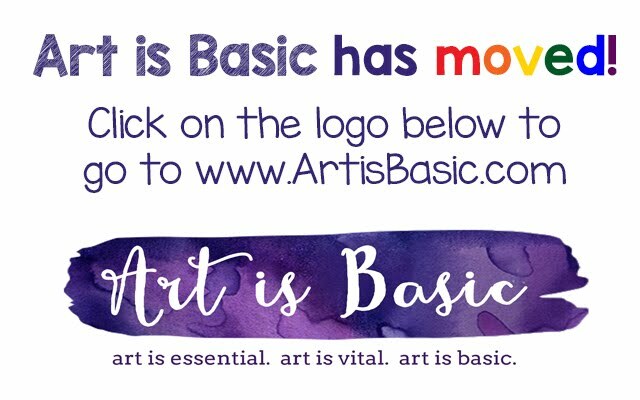 When I was going through college and first started teaching, the internet wasn't as chock full of so many good art teaching ideas. Plus, pages with images took so long to load.. remember that? How amazing would it have been to be able to have all these blogs right at my fingertips when I was just starting out? I mean, if I wanted some information about maskmaking, I would actually have to go to a library to get a book! LOL. The first site that I saw was the Incredible Art Department. I just took another look right now and saw that it has been around since 1994. I have a bunch of art lessons from the past month or so that I have been saving up to show you. I will show them to you over the next month or so. As the year winds down, we have grade reports to write (of course), inventory to do, art rooms to clean up and other loose ends to tie up. On top of that, I'm in charge of the yearbook. The yearbooks have been printed and delivered. They are waiting in boxes ready to be distributed. I'm also in charge of Student Council and we just had our last middle school dance last night. Luckily I have today and Monday off of school to write grades and just relax. So things are wrapping up and I'm looking forward to summer. The day after school gets out (June 6) we are driving to Florida to go to Disneyland! So I will leave with this picture. 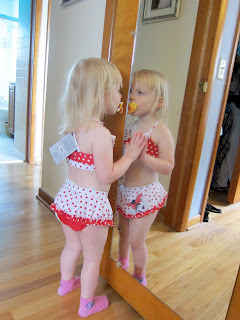 My daughter is trying on her new bathing suit that Grandma gave her. The 4/5s learned how to draw 3-d forms and include shading and shadows. They stacked these shapes to make a "secret city". I got this idea from way back when I was "interning/volunteering" at a middle school when I was in college. The teacher there taught this lesson to her students. She was a great teacher and I had so much fun learning from her. The "internship" was something I set up with my adviser where I went into the classroom once per week for an hour (I think it was an hour or maybe two) for the entire semester and helped out in whatever way she wanted. I wrote reflections and kept a notebook of all the lessons we did and ended up earning a college credit for the internship. It was super valuable at the time because it helped me to see what teaching would be like before I went into student teaching. Plus it was something I could put on my resume when I was fresh out of college and had no actual paid teaching experience. . I ended up student teaching at that school later with a different teacher. Wow, I forgot all about that interning experience! I was trying to recall where I learned about this project and then these memories started flooding back. I have a hard time with memory.. does anyone else? Everything from the past keeps getting fuzzier and fuzzier as I get older. Ok, and I'm not that old, I'm only 32! So, this lesson is based on Mark Kistler's drawing books. This artist had a series of television shows that taught kids how to draw 3-d pictures step-by-step. Here is a video of his old program. The kids love his fashion sense. If you are going to buy any of his books, I recommend this one. I made photocopies of some of the techniques to pass out to the kids while working on this project. 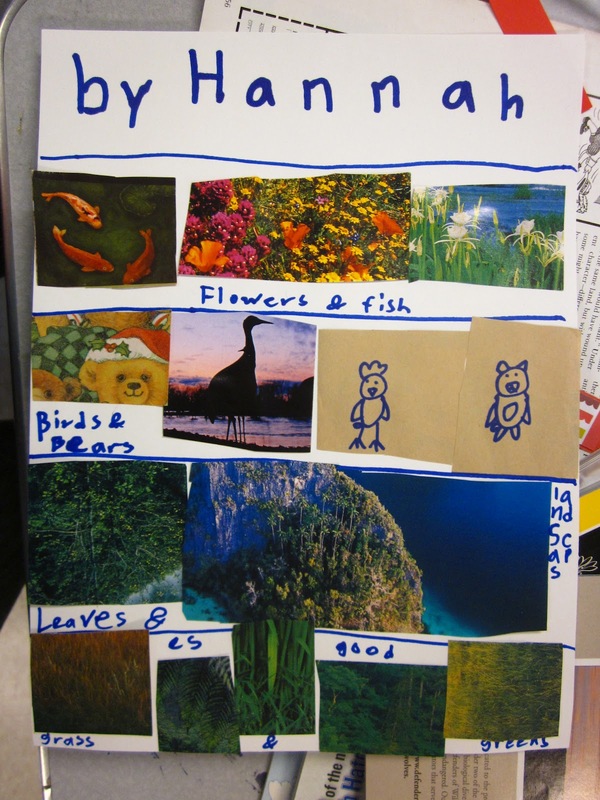 It's also a nice book to have around the art room when the kids have extra time. We made Treasure Boxes at an after school art class that I taught this month. The students were in grades K-6 (about 12 kids). 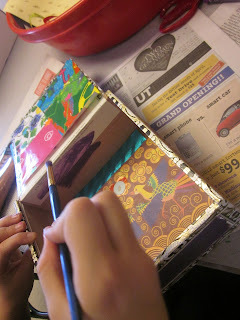 I picked up cigar boxes from a local shop and the kids were able to decorate them with the plethora of supplies I had. Each kid could decorate the box however they wanted. I showed them pictures of Joseph Cornell's mysterious shadow boxes. The class was two hour-long sessions. 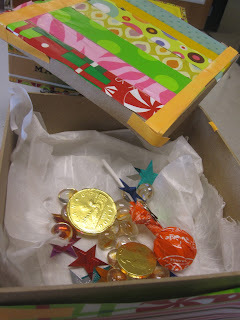 On the second day, the students opened their box to find TREASURES! : chocolate gold coins, little shiny gems, metallic stars and a tootsie pop. On the second day, out came the hot glue gun and my box of random trinkets. 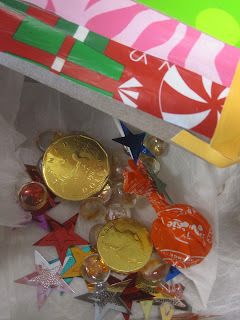 I helped students to glue on little trinkets from my box of random "stuff". 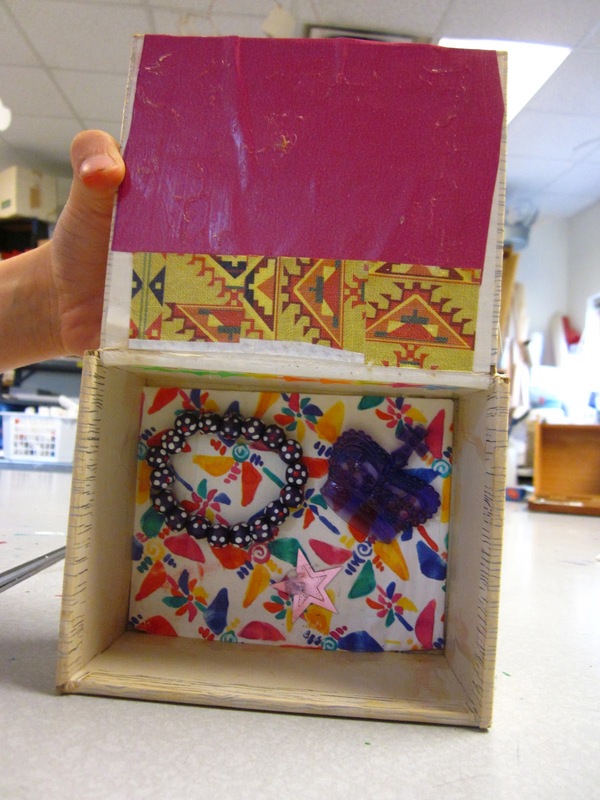 Every art teacher needs a box for collecting random toys, game pieces, charms, plastic or beads that are donated or found. My box of "stuff" is overflowing, so several of the kids spent much of the time hunting for treasures to collect in their box. I had to remind them that we also wanted to finish decorating our boxes! This box was painted black, covered in black tape and patterned paper and then a plastic crown was hot glued on to the center. Ribbon and trims were available on the second day also. Mod-podge was painted on top of some of the boxes. What would you keep in YOUR secret treasure box? 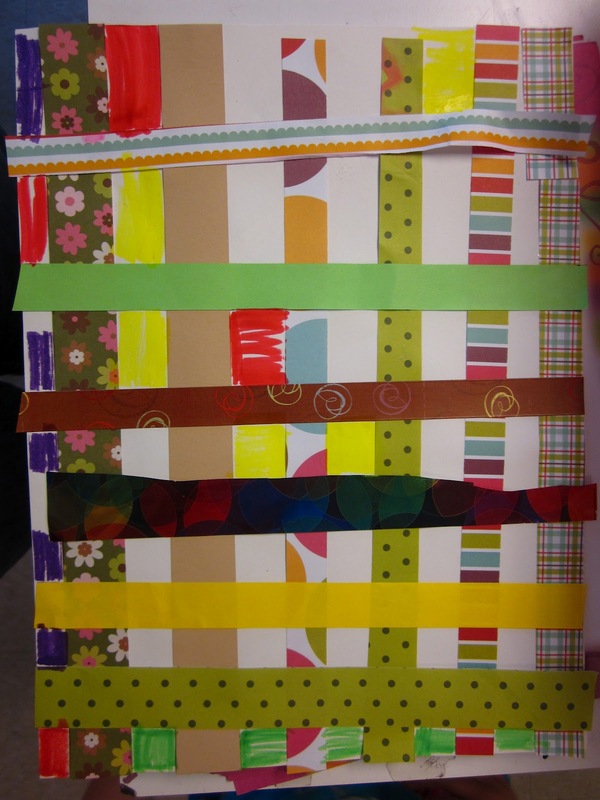 These were some fun paper Memory Quilts that the kindergartners made! Aren't they cute? We read Tar Beach , by Faith Ringgold and talked about her story quilts. 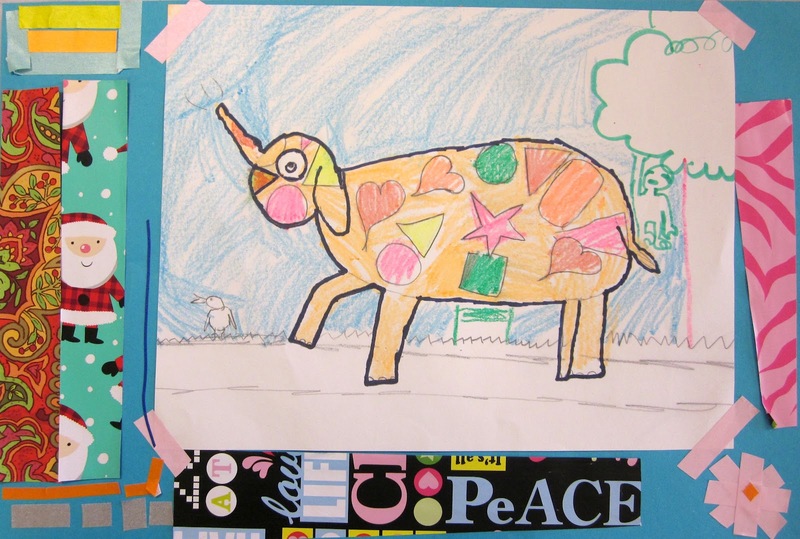 The children received a square piece of white paper, which had 9 squares pre-drawn in pencil (4 x 4 inches each). I had a variety of scrapbook papers pre-cut into 4 x 4 inch squares. The children glued down their squares and could cut the squares in pieces to make designs. In the remaining white spots, they drew pictures of memories from their first year of school. 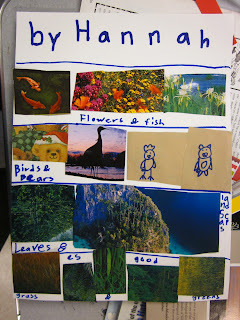 Some of the pictures included a cave that the students went on a field trip to and also the baby chicks that we hatched at school. 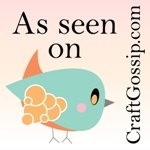 On my personal art blog, I am hosting a giveaway for a special blog hop. You should check it out and enter to win one item of your choosing from my etsy shop!! Also, if you are not reading The Art of Education, you should! 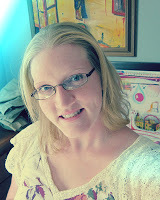 Erica, one of my blogger friends, is now writing for this online art education magazine. I enjoy reading the posts at this blog. Sometimes I like to let the kids loose with a box of supplies and minimal instruction. 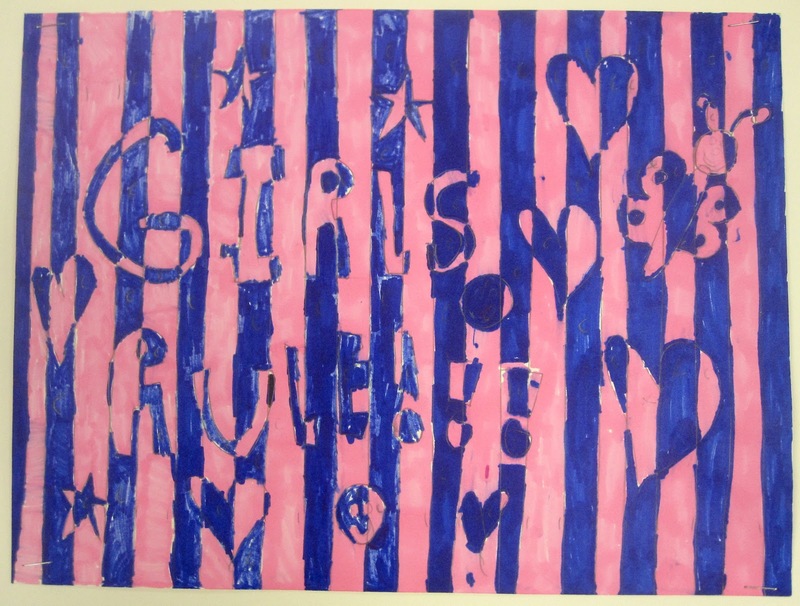 I photocopied some pages from Lynda Barry's book and showed them to the first graders. In the box were paper scraps, magazines, strips of scrapbook paper and random stickers. Isn't this raw and beautiful? First, we looked at the art of Bridget Riley and the Op art movement. 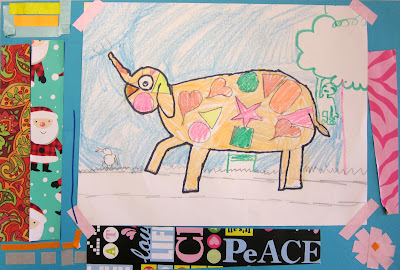 We read a Scholastic Art issue which features this style of art. If you don't get these magazines, they are a great investment. Each year, we subscribe for a class set of this magazine. Then, I save them each year in an envelope labeled with the issue's title. After several years, you will have a collection of lots of subjects to choose from. 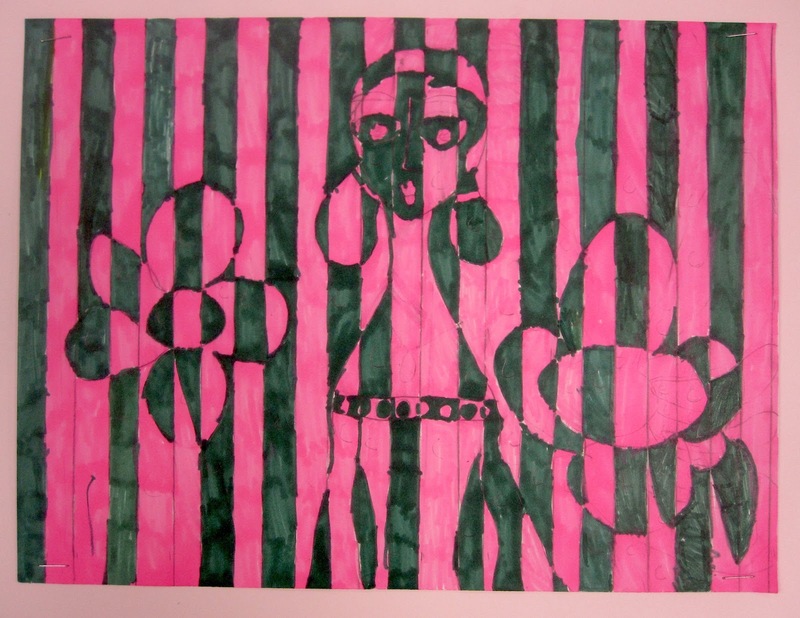 Both of these Op art activities are discussed step by step on the Incredible Art Department. 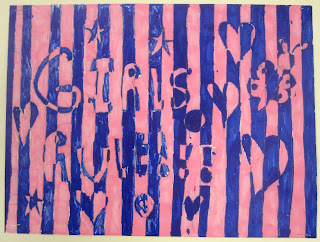 Although, it is interesting that the checkerboard design is actually an assignment I had while I was in junior high school and that is where i got the idea from. 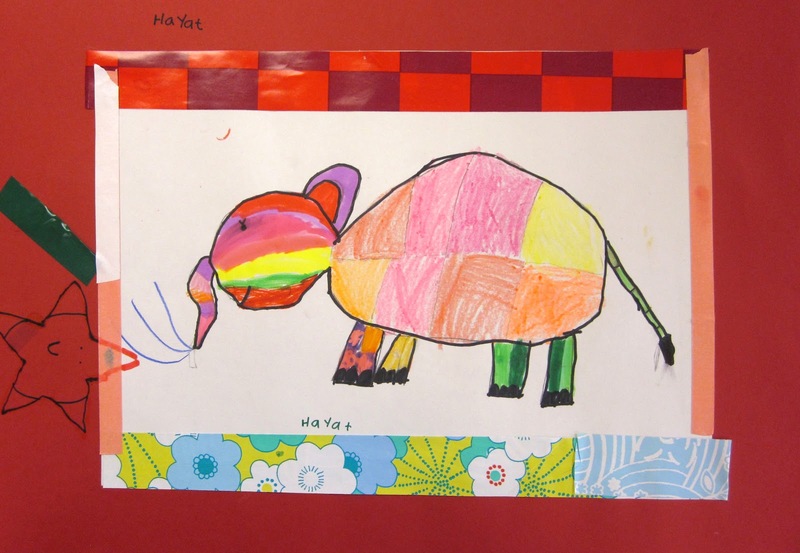 These pictures are based on the book Elmer! 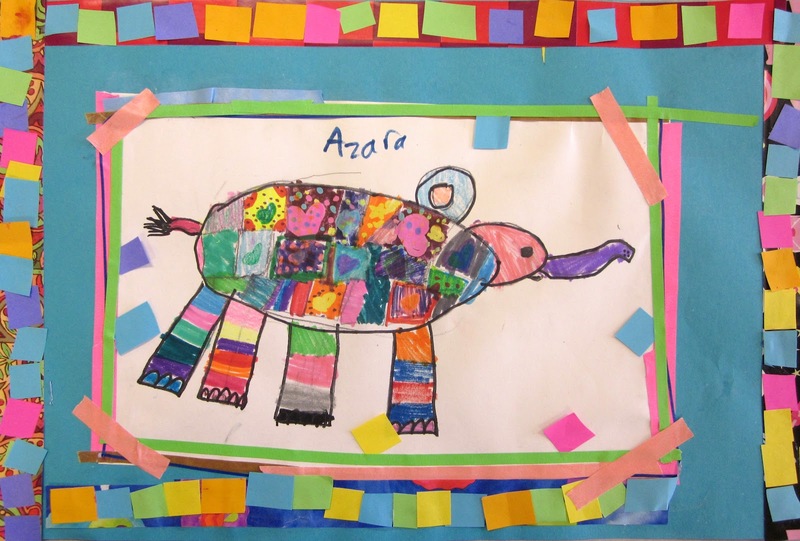 I love this book and the colorful elephants. The kids drew their own elephants and colored them with fun patterns. 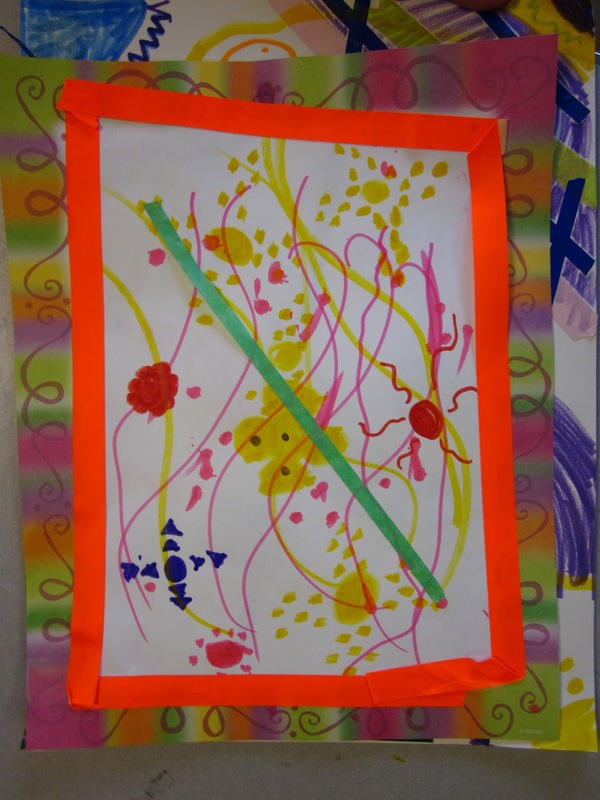 The borders were made by cutting up and gluing strips of wrapping paper and neon cardstock.